The NET E/R GIGA range is designed for Ethernet transmission over optical fiber. 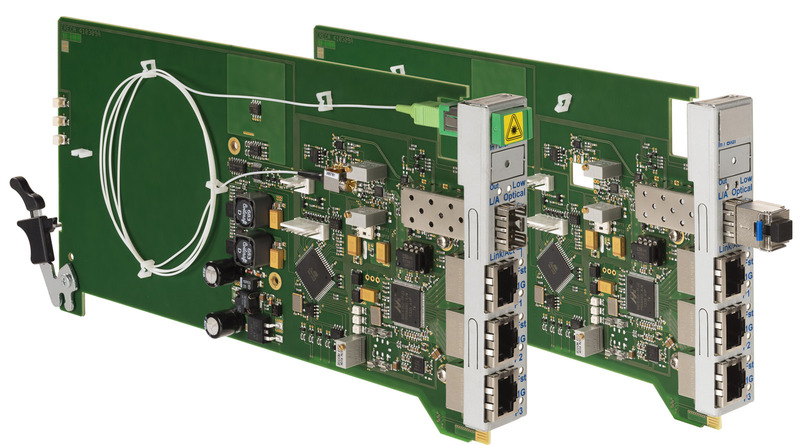 Along with the NET E/R HD SDI video modules these products are dedicated for infrastructure applications like rented transmissions or intra studio intercommunication. The transmission board fits in NET RACER chassis, the NET RACER 3U with 16 modules capacity and the NET RACER COMPACT standalone with 2 modules capacity. The NET RACER built in management unit provides a comprehensive transmission board status through Web Browser or SNMP for local or remote management. This module is built around best in class Ethernet switch with low latency TCAM lookup engine, for on the fly packet forwarding rather than store and forward. As an option this module can be equipped to support, Sync-E, synchronous Ethernet clock management. The module is equipped with 3 gigabit electrical ports and 1 optical trunk port. The optical port can be equipped with an industry standard SFP module or with a built in optical component with better performance or for best application suit. When an SFP in inserted it takes precedence over the internal optical component. Up to three Pre defined V-LAN can be set up through the management system to share the bandwidth for different customers or different networks. It also allow a free low data rate channel for the management of remote NET RACER chassis located at customer plants away from service provider. Depending on distance and number of fiber available for the application, standard wavelength or multichannel CWDM multiplexing can be used. 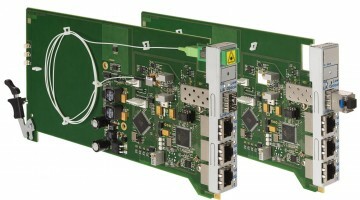 Multiplexers with 4, 8 or 16 wavelength directly fits in the NER RACER platform. Signaling LED: Link/Act for 10/100 Mbs, Link/Act for 1Gbs. Synchronous Ethernet: Built in SYNC-E Phase locked loop with high stability reference (optional). Signaling LED: Module internal power supplies in their tolerance. Standalone box with 2 slots: NET RACER COMPACT.